Efforts to modernize African agriculture continue to focus on the supply-side at the expense of the demand side. In addition to infrastructure-driven agribusiness models, there is an unfortunate belief that agricultural extension is the only important form of knowledge in transforming the agriculture industry. Instead of embracing a holistic approach that identifies knowledge needs and gaps along entire value chains, there is an over-supply of agronomists, extension officers, agricultural engineers and other experts on the supply side. There has not been sufficient emphasis on increasing experts specializing on transport and logistics, specialists on small livestock like indigenous poultry or rabbits, nutritionists, food scientists, economists specializing on local markets and laboratory technicians located at local markets to conduct food safety checks like pesticide residue levels, among others. As agricultural commodities travel along value chains from production to end-users, experts become less and less. From production food is handed over to transporters, traders and vendors, most of whom are not specialists in different commodities they handle. Developing countries have not cultivated mechanisms for facilitating knowledge exchange to accompany agricultural commodities as they change hands. The majority of farmers are experts in production not in marketing. 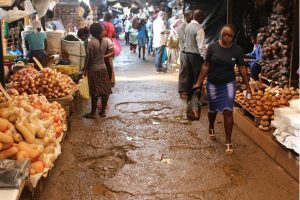 From the farmer, food goes to the market where there are no market experts or auctioneers who can give different commodities proper grades and economic value in ways that enhance price negotiation. Most traders do not have adequate knowledge on the science behind food commodities or cost components for each commodity. Knowledge gaps worsen from traders to vendors who pass on commodities to end-users. Absence of knowledge pathways translates to lack of capacity to give commodities their true value in the market. As a result, most farmers lose out by taking commodities to distant markets when local markets could give them more value. Experts that can attach appropriate value to commodities and facilitate valuing of commodities and negotiation are badly needed. Currently, there is no one to help farmers understand the true value of their commodities beyond using price as a proxy of value. Unavailability of relevant forms of expertise along value chains is the main reason commodities suffer economic losses because no one is available to come up with a correct value of a particular commodity. Instead of locating themselves on the market, government agricultural economists prefer to be armchair experts generating budgets at head office with no accurate contextual input from the ground. If they were located at agricultural markets, agricultural economists would be able to do market-oriented budgeting as opposed to focusing on production-oriented budgeting. Their most relevant duties would include identifying gluts and shortages in the market as well as sharing this information with the production side. They would also identify possibilities for exporting specific commodities and advise policy makers on when and how much to export in order to fill gaps without disrupting local production. Designing of market infrastructure should be informed by commodity experts who know how much space should be allocated to fruits like oranges, tubers like potatoes and vegetables like pepper as well as proper handling practices in different markets. If agricultural markets are organized in ways that reflect different forms of expertise and knowledge, several value chains will create more meaningful employment and contribute immensely to wealth creation, poverty reduction and economic growth. Instead of having an over-supply of experts on a few privileged crops like cocoa, maize, tobacco and wheat, each local commodity should have its own expert or experts, for instance, apples, oranges, ginger, garlic, yams, banana, sweet potato, sugar beans, green mealies, carrots, avocadoes, pineapples and many others. It does not help to have a jack of all agricultural trades and master of none. Expertise should be spread along entire value chains. Although emotional intelligence is twice as important, technical expertise is necessary. The market needs people with a technical intuition, just as value addition requires different expertise from production. Developing countries that do not invest in generating appropriate expertise for different commodities in domestic markets will not become competent players in the highly competitive international market. Italy’s food industry is worth US$160 billion because the country has paid aggressive attention to expertise in different forms of agricultural commodities.